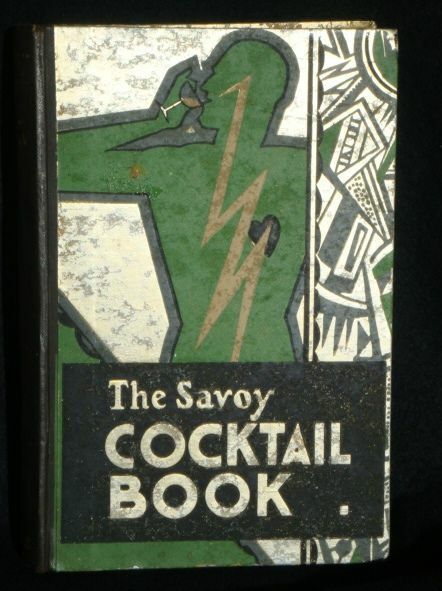 but sometimes he enters into the spirit of the thing by ordering vast amounts of fancy food. 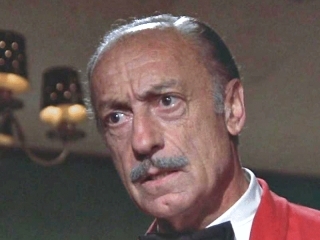 Such is the case in the episode Columbo and the Murder of a Rock Star where the Lieutenant is invited to the fancypants Daryl Club. Hugh Creighton (played by Dabney Coleman) is having a light lunch of chicken noodle soup, as he’s not very hungry. 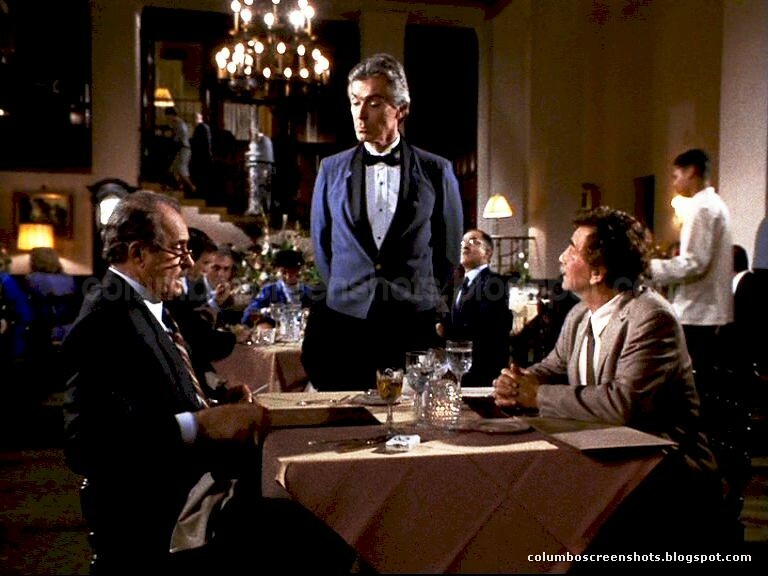 Columbo hesitates for a moment, saying he’s not very hungry either, then proceeds to order New York Steak (medium rare), asparagus with hollandaise sauce, roast potatoes, a shrimp cocktail to start with, a Caesar salad and a piece of sweetcorn. What a feast! 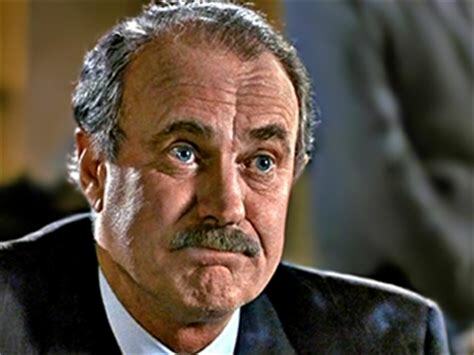 Now, there is a restaurant in Los Angeles called Dan Tana’s that has a steak on the menu called, “New York Steak Dabney Coleman.” It’s been on my to-do list for about a million years to write them a letter asking about the origin of the name of the dish. It HAS to be related to this episode of Columbo surely?! Yes, that’s $68 – which is around £50 at today’s exchange rate, CRIKEY! ..I have not partaken of this steak. But here’s what I can tell you about it from extensive Googling. As a Brit, the idea of pasta with steak is alien to me (as I hear from Greg Swenson serving chili with rice is to most Americans). 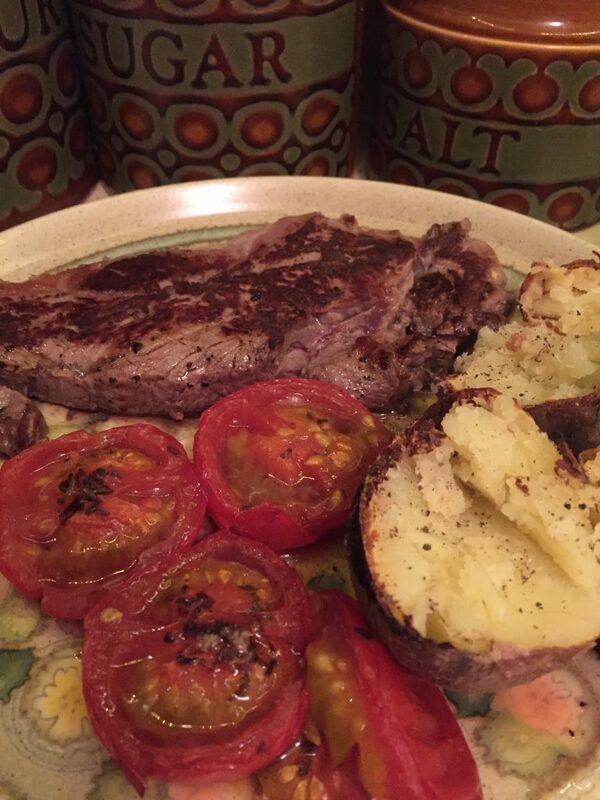 So when I had myself a fancy steak the other day, I served it with tomatoes and pretended I was at Dan Tana’s. 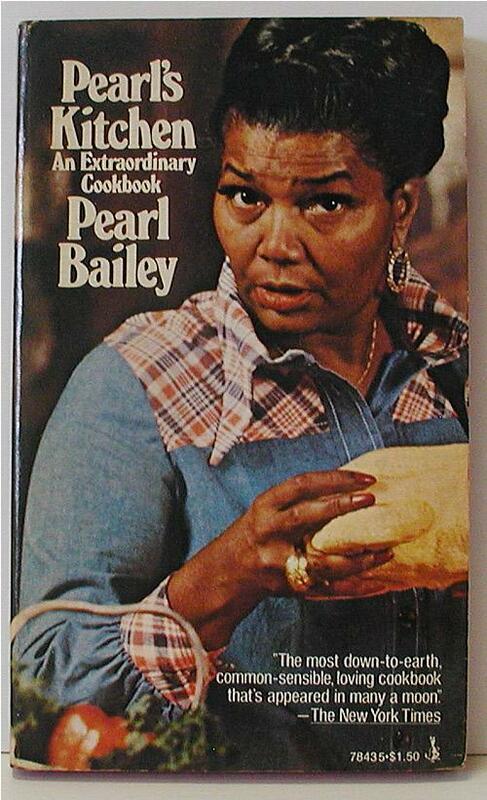 One day soon I’m going to do the whole Columbo kit and kaboodle and have a shrimp cocktail to start, then steak with roast potatoes, asparagus with hollandaise, a Ceasar salad and corn on the cob which I will cook Pearl Bailey style. 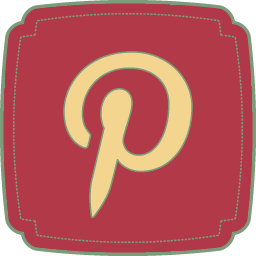 Finally, I just wanted to say a HUGE THANK-YOU to a new blogging chum in the USA called Annette who invited me to write a guest post for her blog. 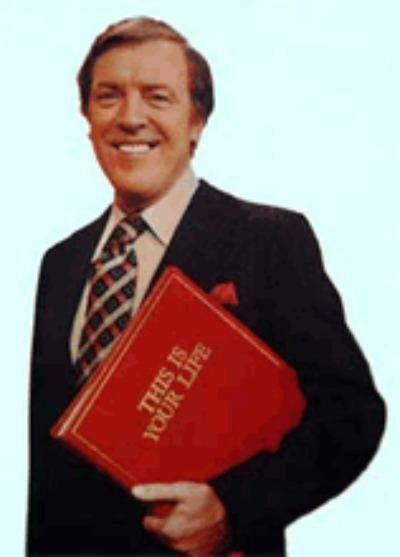 It turned into my life story, it’s a bit like being on “This Is Your Life”! 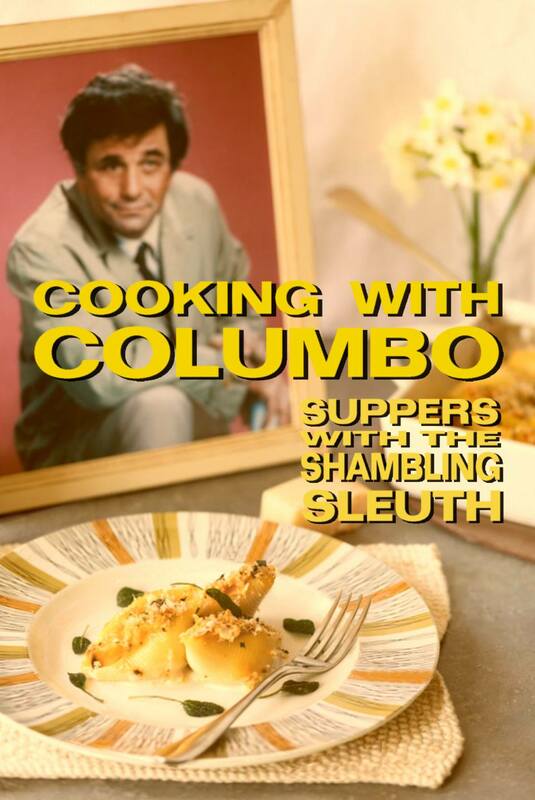 So if you want to know more about my manic movie star recipe collecting habit, and stuff about why I’ve written a Columbo cookbook, do skip over to Annette’s blog and check it out. 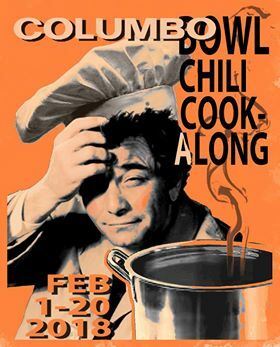 Don’t forget folks, the Columbo Chili Cook-along is underway and there are fab prizes to be won – do join in the fun! Click on this link for the recipe (meat and veggie versions). What do Americans eat with their chilli?! I’d never noticed that they didn’t have rice! 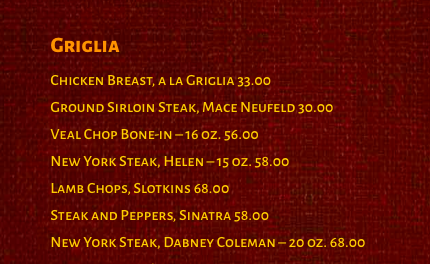 And pasta with steak is a bit weird… I’d definitely have potatoes of some description. Or possibly a baguette but probably potatoes, especially now I’ve seen that picture of your jacket potatoes. Mmmmm -YES! Gotta be jacket potatoes! It dawned on me fairly recently, that you could bake smallish potatoes in the same way as massive ones in a much shorter time! Doh! I’m always chucking a couple in the oven. 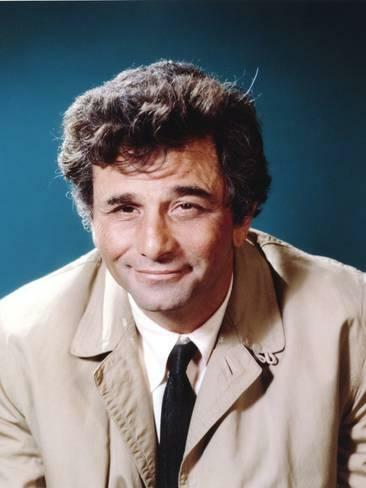 I think Americans tend to have cornbread or tortilla chips or even (if you are Columbo himself) saltines! Of course cornbread! I did know that, but I suppose I always assumed there’d be rice too! Yay! Get that chili a’bubblin!